Few journalists interacted with Indira Gandhi the way Khushwant Singh, doyen of Indian journalism, did. As editor of the now defunct The Illustrated Weekly of India and later The Hindustan Times, he was witness to some of the most historic moments in�Indira Gandhi's 16-year-long rule. Now 90, Khushwant Singh's door has a warning: 'Do not ring the bell unless you are expected.' The years have not numbed his extremely sharp mind as he�took a journey down memory lane with Deputy Managing Editor Amberish K Diwanji to recreate the life of Indira Gandhi. The first of a series of interviews and features on rediff.com to mark Indira Gandhi's�20th death anniversary. Twenty years later, how do you look back on Indira Gandhi? There are two aspects to Indira Gandhi: one as the politician and the other as a human being. As a politician, it is common knowledge about her but as a human being, very few know about her, such as her family and her staff. The rest is conjecture and make believe. I first met her when she was still unmarried and came to Lahore on her way to Kashmir, and she was staying with friends who had brought her over. I have a photograph of her at our house. She was very shy and wouldn't talk much. I next met her when she was�president of the Congress. It was at a meeting over which she was presiding and I was speaking on Madam Cama, I think. Then when she became information and broadcasting�minister in (Lal Bahadur) Shastri's government, I was asked to do an article for The New York Times on the possibility of her becoming prime minister. The article was an adverse account because I quoted people saying her leading the country was not possible. India has never been led by a woman. We might have had a Razia Sultan but that was it. I also said�she was not qualified except for being Nehru's daughter and the fact that she had no political base except for having become Congress president by her father. But she did become prime minister, with the second longest tenure till date? The fact is�after Shastri, people did not want Gulzarilal Nanda or Morarji Desai, and so she became prime minister, selected by a bunch who thought they could control her. But this bunch had not reckoned with her innate political sense or that being prime minister has its own power. She soon sidelined Morarji Desai and�others like�Kamaraj. She really ruled a bit like a dictator. People would say�the Cabinet has only one man (Indira Gandhi) and that the rest are all hijras (eunuchs), but the fact is she reduced them to that level. How do you look back at her rule? There is nothing spectacular about her rule. She was incapable of tolerating any criticism and she picked up an aversion to some persons because she thought they were challenging her, among them Jayaprakash Narayan, a good, honest man.�She couldn't stand him because he was a challenge to her as the leader of the country, especially as people grew disillusioned with her rule. There were problems, droughts, challenges and Jayaprakash Narayan had emerged as a leader. During her reign, corruption�increased to enormous levels. She was really very tolerant of corruption, which was another negative mark against her. She knew perfectly well that some of her ministers were extremely corrupt, yet she took no steps against them till it suited her. If she knew someone was corrupt, she tolerated him but if it suited her, she used the same corruption charge to get rid of him. She really had no strong views on corruption, which went sky high during her time. Also, she felt uncomfortable with educated, sophisticated people. So you have the rise of people like Yashpal Kapoor, R K Dhawan, who was a stenographer who worked in her office, Mohammad Yunus, who just hung around her. I believe this was because she had no real education. She went to Shanti Niketan, then she went to Badminton School abroad, then to Oxford. Nowhere did she pass an exam or acquire a degree. I think that bred a sort of inferiority complex of not being recognised as an educated person. She would pretend to have read a lot of books. She spoke French, which she�picked up when she accompanied her ailing mother Kamala to Switzerland, which went in her favour. There were pros and cons but there was this sense of insecurity when it came to highly intelligent people and people with clear records. She felt more comfortable with second-rate people. How did her insecurities, about which much has been written, affect India? In her insecurity, she destroyed the institutions of democracy. She packed Parliament with her supporters with loyalty being more important than ability; she superseded judges; she corrupted the civil service.�Favouritism became a great sport with her. She also knew how to use people against each other and was quite a master of that. She would patronise somebody and when she thought he was getting too big, instead of appointing him to a senior post, she would appoint his close associate, knowing this would create a rift between them. The best example is of V P Singh. It was his elder brother (Santa Bux Singh) who believed he would be made minister but instead she picked V P Singh, the lesser qualified of the two brothers, which only created enmity between the brothers. She would do this with calculated skill and in the bargain cause enmity between brothers, split up families. In the long run it was not good for the country to play such games as she did. What is her greatest achievement? Her greatest moment, the triumph in her life, was the way she handled the Bangladesh crisis, where all her skills came together. She made a complete fool of the Pakistanis. India faced a huge crisis with a flood of refugees entering the country. She tried to garner international support and went round the world telling them what was happening but got no backing except from the Soviet Union, which any way was with us. Then, when she realised�the crisis had to reach a climax, she proved very astute. For instance, an Indian Airlines plane was hijacked. Today we know that it was the Indians who manoeuvred to get the plane to land in Lahore. Then, in Lahore, Zulfiqar Ali Bhutto (then Pakistan's foreign minister) proved stupid enough to have the plane blown up in his presence. This gave India the excuse it needed to stop flights between West Pakistan and East Pakistan (now Bangladesh) over India, something that gave India a clear edge as the war drew nearer. Now, Pakistani planes had to fly all the way round India and refuel in Sri Lanka to communicate between the two wings. I also think it was on her advice that the Indian Army built up the Mukti Bahini. And by the time (then Pakistan President General) Yahya Khan realised what was happening and declared war, the Indian Army was, I think, well about 100 miles inside Bangladesh. In less than a fortnight, the Pakistani army surrendered. The Pakistanis prepared to defend the towns but the Indian troops just avoided the towns and headed straight for Dhaka. It was by all accounts a master strategy and Indira Gandhi very deservedly got the Bharat Ratna. But the problem of reaching a height is that you can only come down from there. And then we have the Emergency. Yes, that is true. But when it came to the Emergency, I think the Opposition too behaved very recklessly. There was no doubt that the country was fast sliding into chaos. I recall schools not opening, colleges not opening, huge processions, riots. I think Jayaprakash Narayan made a mammoth mistake when he led this huge rally in New Delhi where he told the people to gherao�legislators, not allow them to attend office, like it was happening in Gujarat at that time (where the Nav Nirman riots were going on and crowds had mobbed the Gujarat legislature). He asked people to do the same to Parliament in New Delhi and not allow elected people to attend to their duties. Worse, he asked the police and the Indian Army personnel to remove (the legislators). Now, there are limits to protests in any democracy and this was exceeding the limits altogether.�There were the other leaders, you can name them all, who were thoroughly enjoying her discomfiture, thinking she would fall on her own. I wrote a letter to Jayaprakash Narayan. I knew him and was very fond of him, but I wrote that he was transgressing the boundaries of limits in a democracy. He wrote back a long letter, which I published in The Illustrated Weekly. But before anything else could happen, the Allahabad high court judgment came through and she clamped the�Emergency. I believe she was right and there was no other choice. Do you�believe after all these years that the Emergency was justified? I still believe that when she imposed the Emergency, she had every right then because leaders of the Opposition were behaving in a total reckless, irresponsible and anti-national manner, just enjoying the spectacle. I recall very clearly that when the Emergency was imposed, there was a general sense of relief throughout the country. Schools reopened, colleges reopened, trains ran on time, and there was a sense of gratitude that the country was back to normal. Of course, the freedom of the people had been taken away. I called on her and told her�she must not gag the press. I told her�there were people like me who supported her but that no one would believe us, saying you can't say anything else or she will lock you up. But she didn't agree saying you can't have (a state of) Emergency and freedom of the press because that would create problems. I thought she'd lock me up but she didn't, maybe because I had defended her and her son, Sanjay, long enough. Anyway, she lifted the Emergency because she was totally misled by the CBI into believing that she was hugely popular and would win the election. And when elections were held, she was surprised to learn that she had earned so much hatred throughout the country that she was defeated. If I can step back a bit, you said�when she imposed the Emergency, there was relief in the country, yet she lost the election? So what went wrong? When you say Sanjay, he had no legitimacy. He was only the prime minister's son. What he had in mind was absolutely correct. All the family propaganda was not working so he made it the top priority. Then slum clearing. People took the cases to court and they went on for years. He said demolish the slums but give them alternative arrangements that were done. The family planning stories were vastly exaggerated: people being picked up from cinema line queues, from villages, etc� only a tenth of them was true but these stories spread like wildfire and she paid the price. The Emergency was made into a monster. But there must have been reasons for the Emergency to be demonised? She had locked up so many people, including 85 year olds. Anyone who said anything was locked up. But it wasn't her alone. It was Sanjay, his wife Maneka, his mother-in-law, Mohammad Yunus, who were running riot and anyone who said anything suddenly found himself in the lockup. True, but I don't think she realised it. Perhaps the problem started from the fact that you had the Emergency in the first place, or that you had it for so long? I think it could have been a short Emergency and she could have handled the situation better. She could have put her foot down when she realised that people were misusing the Emergency, and there were far too many people around her who were misusing it. Also, putting the maharanis of Jaipur, Gayatri Devi, and of Gwalior, Vijaya Raje Scindia, in jail with pickpockets and prostitutes simply revealed the vindictive nature of her character. It also created a large number of enemies in very important places. That all together created hatred for the whole family. Don't you think that when Justice Sinha passed the verdict against her, she should have stepped down? It was a very dubious judgment: that she could sit in Parliament but she could not vote. (Nani) Palkhivala, who was her lawyer, told her that he would win the case for her in appeal. He said this verdict was a bit like locking up a person for a small traffic offence. 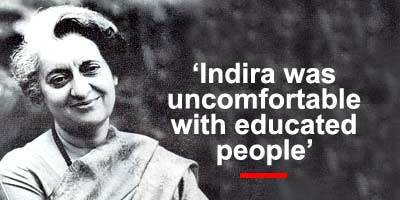 But by then, she had become very nervous and people like Siddhartha Shankar Ray and Sanjay Gandhi advised her to impose the Emergency. But I think if she had not done what she did, then she would have been a bigger figure. After she imposed the Emergency, Palkhivala refused to fight her case in court. Then they (Mrs Gandhi's cronies) harassed Palkhivala, he was removed from various Tata boards. And that kind of vindictiveness followed, which only created more enemies all along the way, which they needn't have done. But then she came back to power. Now was this because the Janata Party was inept or was it also because the people said, 'Okay, we punished you, but now we want you back!' Or was it a combination of both? Yeah, I think you are right. The anger and�rancour against her had mitigated by then.�Morarji Desai and Charan Singh proved totally inept in handling the situation and people said she was better than this lot. But was not her next few years in power her worst? None of the strength of purpose that she had earlier seemed to be there. I think that can be timed from Sanjay Gandhi's death (barely six months after she took office in January 1980). She lost her moorings when he died because he dominated her. He was a very dominating figure and she was certainly building him up to be the prime minister, totally ignoring Rajiv who she thought was a buddhu (lacking in intelligence). After Sanjay died, she dithered, she couldn't make up her mind, she became a nervous wreck� She wouldn't sleep at nights, walking around the lawns of her residence, there was this permanent tick in her eyes, and I think it showed in the way she bungled over (Operation) Bluestar. You believe she erred in Operation Bluestar? I believe she was misled. I think her own judgement would have been right. She had no prejudice at all, not against the Muslims, not against the Sikhs or anyone. She consulted the people and got contrary advice from different people. She didn't trust (President) Zail Singh because he was playing both sides, sometimes supporting (Jarnail Singh) Bhindranwale against Darbara Singh (the then Congress chief minister of Punjab). So she turned to the Army and I know for certain, despite what they (the Army) say, that she was assured by people like General (Arun) Vaidya and (then Lieutenant General K S) Sundarji that once the army went in and surrounded the (Golden) Temple, no fight would be put up and Bhindranwale would surrender. I think they even said the�operation would be over in two hours. It was a total miscalculation. Bhindranwale was a thug, a fanatic, and he fought like a fanatic and didn't give in. The battle instead of two hours lasted two days and nights. And with a heavy toll. She had believed the Army when it told her�there would be no fighting. I am also in search of email number of khuswant singh. Like Indira, Sonia is also not well read though she may have passed some exams? How does Khushwant rate Sonia?